1.1.5 Public safety and tranquility. 2.1 A Corporate Member shall utilise his knowledge and expertise for the welfare, health and safety of the community without any discrimination for sectional or private interests. 2.2 A Corporate Member shall maintain the honour, integrity and dignity in all his professional actions to be worthy of the trust of the community and the profession. 2.3 A Corporate Member shall act only in the domains of his competence and with diligence, care, sincerity and honesty. 2.4 A Corporate Member shall apply his knowledge and expertise in the interest of his employer or the clients for whom he shall work without compromising with other obligations to these Tenets. 2.5 A Corporate Member shall not falsify or misrepresent his own or his associates’ qualifications, experience, etc. 2.6 A Corporate Member, wherever necessary and relevant, shall take all reasonable steps to inform himself, his employer or clients, of the environmental, economic, social and other possible consequences, which may arise out of his actions. 2.7 A Corporate Member shall maintain utmost honesty and fairness in making statements or giving witness and shall do so on the basis of adequate knowledge. 2.8 A Corporate Member shall not directly or indirectly injure the professional reputation of another member. 2.9 A Corporate Member shall reject any kind of offer that may involve unfair practice or may cause avoidable damage to the ecosystem. 2.10 A Corporate Member shall be concerned about and shall act in the best of his abilities for maintenance of sustainability of the process of development. 2.11 A Corporate Member shall not act in any manner which may injure the reputation of the Institution or which may cause any damage to the Institution financially or otherwise. 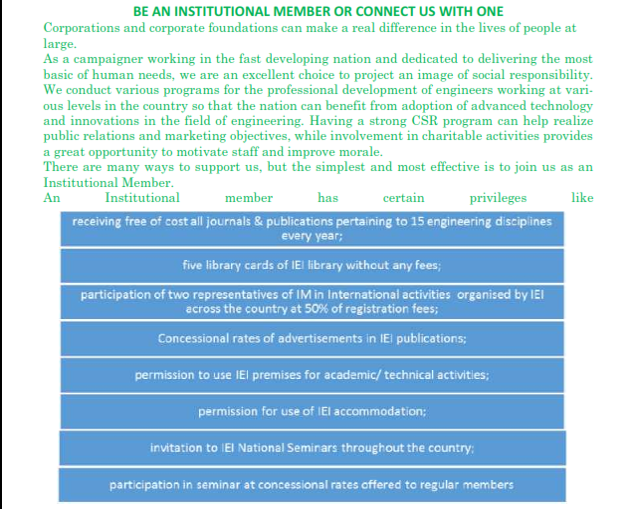 3.2 The Corporate Members of the Institution hold a privileged position in the community so as to make it a necessity for their not using the position for personal and sectional interests. 4.9 should reveal the existence of any interest – pecuniary or otherwise – which may affect the judgement while giving an evidence or making a statement. 5.0 Any decision of the Council as per provisions of the relevant Bye-Laws of the Institution shall be final and binding on all Corporate Members.